Homemade granola is quick to make and takes little effort. 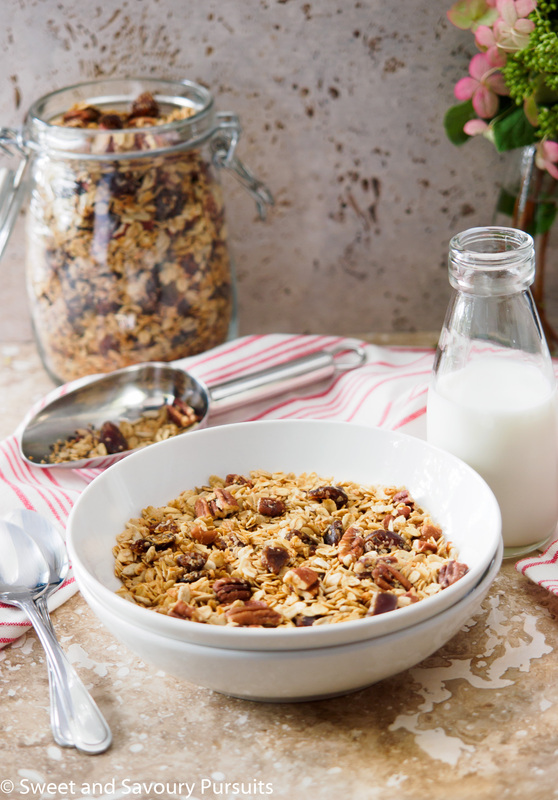 Try this Homemade Maple Pecan Granola with Dates and you’ll be rewarded with delicious and healthier granola. Did you know that you could make the healthiest and best tasting granola right in your own kitchen? This recipe for homemade maple pecan granola with dates is so much better than most granola that comes out of a box. If you haven’t already made your own granola then let me tell you that it’s incredibly easy and takes very little time or effort. It’s also the best way for you to control how much sugar and fat you are consuming with your granola. If you have made granola at home then you already know that it’s a delicious treat. This homemade maple pecan granola is full of texture. The oats, seeds and pecans are perfectly toasted which gives this granola a nice crunch. Make sure you use whole rolled oats in your granola, they are much better for you and contain fibre and protein that help fill you up. I found the amount of maple syrup used to sweeten this granola just right, if you prefer it sweeter then I would recommend adding 1 or 2 extra tablespoons of maple syrup. I chose coconut oil for the fat in this recipe, if you choose to use it as well, make sure to melt some before measuring it. You can also use other light tasting healthy oils. 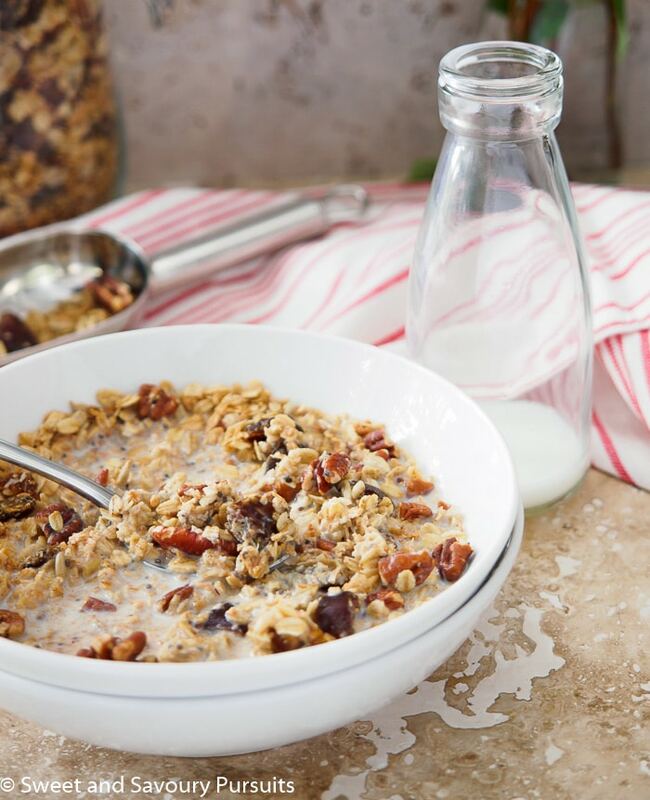 Homemade granola recipes are so adaptable, so don’t feel that you have to stick to an exact recipe, have fun and choose which of your favourite ingredients will go into your granola. When making substitutions just make sure to maintain the same ratio of wet-to-dry ingredients as the original recipe. 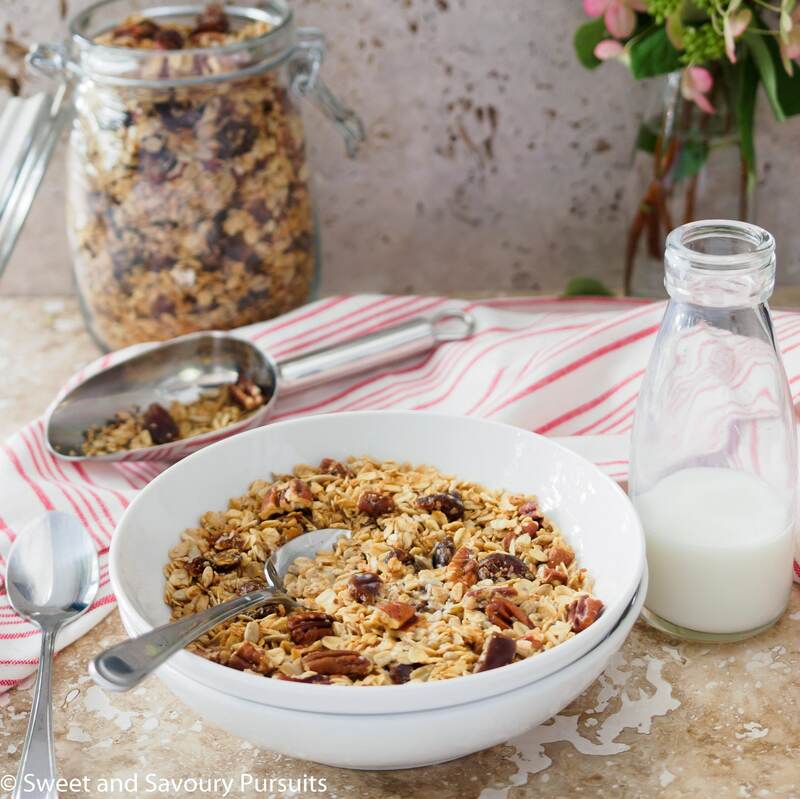 Give this Homemade Maple Pecan Granola with Dates recipe a try, you can eat it with your favourite dairy or non dairy milk, yogurt or just on it’s own. You’ll be rewarded with delicious granola that is good for you. Enjoy! Homemade granola is quick to make and takes little effort. Try this homemade maple pecan granola with dates and you'll be rewarded with delicious and healthier granola. In a large bowl, combine the oats, pecan pieces, dried coconut, sunflower seeds, chia seeds, salt and cinnamon. Add the melted coconut oil, the maple syrup and vanilla and stir well. Spread on two lightly oiled baking sheets. Place each baking sheet on the two lowest racks in the oven, stir the granola and then alternate their position on the racks every 10 minutes. Bake for a total of 20 to 25 minutes or until granola is fragrant and toasted. Remove from the oven and let the granola cool before adding the chopped dates or other dried fruit of your choice. Stored in an airtight container, this granola will keep well for a week. So happy you loved the granola, I also think it’s great that you used what you had on hand for this recipe, thanks so much for leaving a comment! How do you keep the dates from making the granola soft? Mine is soft the next day in an airtight jar. Hi, I haven’t had that problem but here are a few things I can think of that might help keep your granola crunchy: 1) make sure to use rolled oats, not instant or quick cooking. 2) make sure you toast the granola sufficiently in the oven. 3) Add dates and all dried fruit after baking the granola. Hope that helps, let me know if you give it another try. This one is absolutely amazing thing!!! I love granola and oats! and dates are one of my fav sweets! Yummy! 🙂 And healthy! So happy to hear that, hope you’ll give this granola a try then. What a delicious looking breakfast! I’ll take anything with maple and pecan in it – YUM! Thanks! I know its hard to go wrong with pecans and maple syrup! Thank you so much for pinning Nagi. I can’t believe that anything you make can be boring, I’ve looked at your recipes and they’re so creative. Hope you like the granola! Wow this sounds so good! I love granola! Thank you Lynz! It was delicious, I just finished the last of it this morning, now I’m looking forward to my next batch, think I’ll try switching things up a bit! It looks so good. How long did it last? It lasted two weeks, but after 10 days the dates started to get a bit hard. But still really good to the end. ok that is awesome! I have to try it I love the ingredients! Thanks! It really was amazing, I loved the combination of flavours in it. This granola recipe looks great! I have made my own granola before, but not with coconut oil. I will have to try this recipe. I agree that homemade granola is so much tastier than the kind from a box. Thank you for sharing! Thanks Jenny! It was my first time using coconut oil in granola as well and I really loved it. I love making my own granola. Although, I admit I always add chocolate. (I even add chocolate to store bought granola; it’s a weakness of mine!) Your focus on the different textures, as well as flavors, in your granola really shows and makes for such a great treat/snack. Thank you so much for bringing your granola to the fiesta this week, and I hope you had a fantastic weekend! That’s great. If adding chocolate makes you happy then why not! I have not yet tasted a granola with chocolate in it, but I can’t imagine not liking it! I have not made granola in a few months but this recipe will get me back into the habit for sure. Thanks Hilda! I think this is one of my favourite blends of fruit and nuts. Thanks Nancy, I did love the maple syrup in this granola. I’m thinking of making another batch but with pumpkin flavours. I am definitely going to make this. I like that it uses coconut oil and maple syrup, and that the other ingredients are all so healthy. Gorgeous photo, too. Love the colour and composition. Thanks Louise! Do let me know how you like the recipe and I would love to know if you switch up the ingredients. Ahhh, thanks so much Amanda!